I can’t get enough of the rainbow! I love stripes and bright colors that intermingle and glow! Maybe it’s because there is not enough colors outside this time of the year? Everything is gray and muddy, I have to color my own world. I hope you’re doing that too? After the ripple blanket I went on to my rainbow socks! Do you name your socks? I always do. 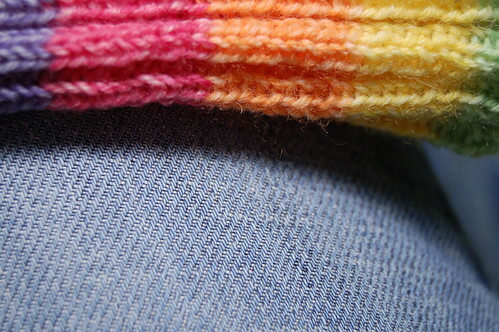 Search for socks in my blog and you’ll see what the previous pairs have been called! In my lap is my knitting, my old craft tote with Hello Kitty and the ripple afghan. The yarn: Opal Feelings sock yarn. Bought at Syfestivalen from Britt. Feeling: Fun to knit! I like knitting stripes, especially with this self striping yarn where you don’t need to weave in the ends every time you change color. Isn’t that neat? After finishing the first knitting project of the year I’ve been listening to the new radio show Lifehack Live in my ipod while knitting on a fuzzy project in this yarn! from China. You’ll soon see what it is! The Lifehack Live show is great, with tips on productivity, business and organizing! I really like it and recommend you to listen to one or two shows this week. I’ve gotten the award You made my day by both Yvonne and Tine (who is going to have a baby)! If you have commented on this blog in 2008 you’re on my list of people who has made my day! Thank you to all of you for being so nice to me! 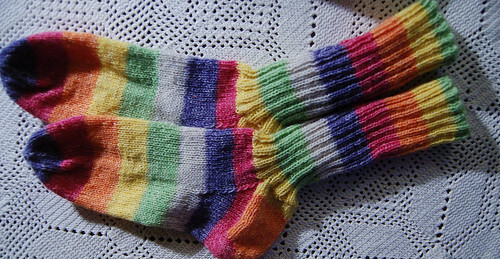 This entry was posted in Crafts and tagged finished knit, knitting, rainbow. Bookmark the permalink. Hanna, those socks are beautiful!! Well done on them :o)!! 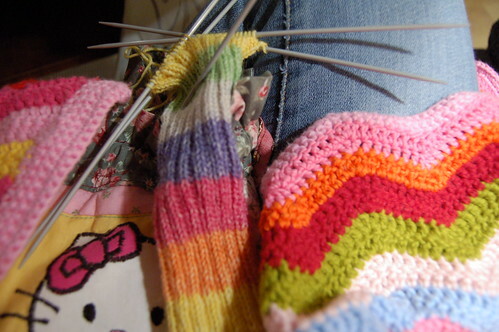 I have a stripey (chocolate brown & baby blue) sock that I started last year…and I haven’t finished them yet. This gives me some inspiration to get back to it and finish them!! Thanks & I hope your week is off to a great start. Oh, the colors are just so beautiful! That comfy pic of your ripple afghan working on your sock is just PERFECT! Those are lovely :) You’re so productive, it’s an inspiration. Hanna those socks will surely brighten up any cold, dull day. Rainbow socks are great, I could do with a pair, too, the weather is gloomy over here… (wait, I do have a pair of rainbow socks in my drawer, yikes! *^v^*). What bright and cheerful socks. I love them! What fun to wear. Those socks ALMOST make me want to learn to knit! They’re delicious. Nicely done! Your colors blow my mind. I’m a rainbow person, too. I love the colors on your blog–especially your mother’s tablecloth the other day. From what you’re doing these days, I foresee a bright year for you in 2008. I love the socks. So full of yummy colours! At one point in my life, I used to be known for always having crazy colourful socks… Hmmm, maybe I should start again! Farver ! Det l?nges vi efter- i s?r denne vinter , der her i DK , bare har v?ret gr? og trist. Selvstribende str?mpegarn – det er alts? sjovt at strikke med! oooohhhhh, I just LOVE your stripy rainbow socks and your ripple afghan!!! The colours you have used are just so yummy and delicious! TOO CUTE!!! It?s easy to be nice to you! I was surprised to see all these fabulous colours in your knitting work. I like to see your rainbow blanket and I like your socks, too.